Jericho arrived at Out of Africa Wildlife Park on September 5, 2013. Having traveled more than 2,100 miles from Busch Gardens in Tampa, FL, Jericho was eager to stretch his legs and claim his new 6-acre estate; an estate six times larger than his previous domicile. Jericho carries on the beloved legacy of Boom Boom, the park’s first rhino that passed away from old age. Jericho’s 4,800-pound frame and handsome features made it worth the yearlong wait. White rhinoceroses are found in grassland and savannah habitat. South Africa remains the stronghold for these rhinos, with smaller populations having been re-introduced to Botswana, Democratic Republic of Congo, Kenya, Namibia, Swaziland, and Zambia. The rhinoceros are the world’s second largest land animal after the elephant. The southern white rhino is the largest and most numerous species of rhinoceros that exists. It has a wide mouth used for grazing and is the most social of all rhino species. It has a massive body and large head, a short neck and broad chest. The head and body length is 11 to 13 feet in males and 10 to 12 feet in females, with the tail adding another 28 inches. The male shoulder height is 5 ½ to 6 ½ feet, while the female shoulder height is between 5 and 6 feet. Weight in this animal typically ranges from 3,000 to 8,000 pounds. The male, averaging 5,000 pounds is heavier than the female, at an average of 3,700 pounds. On its snout it has two horn-like growths, one behind the other. These are made of solid keratin. This differs from the horns of cattle and their relatives, which are keratin with a bony core, and deer antlers, which are solid bone. The white rhinoceros also has a distinctive hump on the back of its neck that houses the ligaments that support its large head. Each of the four stumpy feet has three toes that act like a footpad. The color of the body ranges from yellowish brown to slate grey. Its only hair is on the fringe of the ears and tail bristles. Its ears can move independently to pick up sounds but it depends most of all on smell. Females reach sexual maturity at 6 to 7 years of age while males reach sexual maturity between 10 to 12 years of age. Courtship is often a difficult affair. The male stays beyond the point where the female acts aggressively and will give out a call when approaching her. The male chases and or blocks the way of the female while squealing or wailing loudly if the female tries to leave his territory. When ready to mate the female curls her tail and gets into a stiff stance during the half hour copulation. Breeding pairs stay together between 5 and 20 days before they part their separate ways. Gestation occurs around 16 to 18 months. A single calf is born and usually weighs between 80 to 140 pounds. Calves are unsteady for their first 2 to 3 days of life. When threatened the baby will run in front of the mother, who is very protective of her calf and will fight for it vigorously. Weaning starts at 2 months, but the calf may continue suckling for over 12 months. A single calf does not live on it’s own until it’s about 3 years old. The birth interval for the white rhino is between 2 and 3 years. Before giving birth the mother will chase off her current calf. White rhinos can live 40 to 45 years in captivity. The white rhinoceros is one of the largest pure grazers. It drinks twice a day if water is available, but if conditions are dry it can live 4 or 5 days without water. It spends about half of the day eating, one third resting, and the rest of the day doing various other things. White rhinoceroses, like all species of rhinoceros, like to wallow in water holds or mud holes to moisturize their skin, cool down, and remove parasites. White rhinoceroses live in crashes or herds of up to 14 animals (usually mostly female). Sub-adult males will congregate, often in association with an adult female. Most adult bulls are solitary. Dominant bulls mark their territory with excrement and urine. The dung is laid in well-defined piles. It may have 20 to 30 of these piles to alert passing rhinoceroses. Marking territory is also achieved by spraying urine after wiping their horns on bushes or the ground. Rhinoceros are non-ruminant herbivores. In the wild they feed on grass, aquatic plants, shrubs, trees, twigs, and branches of low bushes. In captivity the primary diet is timothy hay and alfalfa. They will consume between 100 and 120 pounds of food each day. They love sweet foods like watermelon. Sweet foods provide an excellent delivery system for medicine, disguising the taste of pills. Rhinos generally eat leafy material, although their ability to ferment food in their hindgut allows them to subsist on more fibrous plant matter, if necessary. Unlike other perissodactyls, the two African species of rhinoceros lack teeth at the front of their mouths, relying instead on their powerful premolar and molar teeth to grind up plant food. A popular theory of the origins of the name “white rhinoceros” is a mistranslation from Dutch to English. The English word “white” is said to have been derived by the mistranslation of the Dutch word “wijd”, which means “wide” in English. The word “wide” refers to the width of the rhinoceros’ mouth. Early English-speaking settlers in South Africa misinterpreted the “wijd” for “white” and the rhino with the wide mouth ended up being called the white rhino. Don’t let the size and appearance fool you. The white rhinoceros is quick and agile and can run up to 30 mph. White rhinos have two horns, the foremost more prominent than the other. Rhino horns grow as much as three inches a year, and have been known to grow up to five feet long. Females use their horns to protect their young, while males use them to battle attackers. The largest recorded white rhinoceros was about 9,900 pounds. The olfactory passages responsible for the rhinoceros’ smell are larger than their entire brain. The white rhinoceros has the widest set nostrils of any land-based animal. Almost at the edge of extinction in the early 20th century, the southern subspecies has made a tremendous comeback. In 2001 it was estimated that there were 11,670 white rhinos in the wild with a further 777 in captivity worldwide, making it the most common rhino in the world. By the end of 2007, wild-living southern white rhino had increased to an estimated 17,480 animals based on a 2008 IUCN study. According to Save the Rhino International, those numbers have grown to 20,405 most recently. While the southern white rhino is no longer considered an endangered species, the status of the black rhinoceros could not be more troubling. 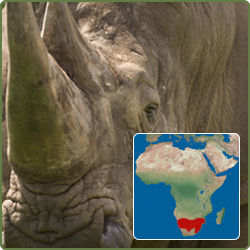 Now critically endangered, numbers for the black rhino have dwindled to less than 5,000. Don’t buy rhino horn products! Illegal trade in rhino horn is a continuing problem, posing one of the greatest threats to rhinos today. Donate towards much-needed anti-poaching equipment and support for rangers across Africa. Out of Africa Wildlife Park supports the efforts of great animal conservation organizations such as The David Sheldrick Wildlife Trust.